I’m going to guess this one is really quiet! I always say that the first few days tells me quite a bit about a horse. We headed over to pick up Halfway House at the CANTER farm yesterday. We grab him out of the small field where the farm owner left him for us. He greeted us at the gate with ears up and a nice expression. We got him out and as I went to let the horse out that was keeping him company, two of the other horses ran in there. I was trying to get them out of the pen but they were running, bucking and acting like loons. Kurt was holding Halfway House and he was falling asleep waiting for me. I gave up and just left the darn gate open and sent a text to the farm owner about the silly horses who didn’t want to get out. It was dark by then and we loaded right up on the trailer. He never looked around, never hollered to his friends and just seems more interested in an adventure than anything else. We unloaded at home and he walked right into the barn with confidence. Went out and met Ridge and started eating some hay. Then he got a nice bath and he let me clean his sheath! He LOVES playing in the water and was drinking out the hose and spraying water on me. Total goofball already. This guy has a big personality and boy is he sweet. 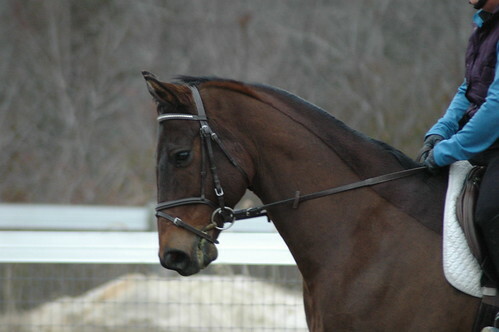 He reminds me so much of Areutrue (former CANTER horse) in his looks and personality. I didn’t stick him but I would say he is 15.2ish but wide. Very excited to get on him!!!! I am going to be shocked if he is anything but a packer. When I started working with CANTER Mid Atlantic six years ago there were not many groups that were offering retraining as part of their rehoming mission. Now there are new groups popping up all the time and also groups that didn’t offer retraining that are now adding it to their program. I think that every group operates a bit differently which is what makes studying them all so interesting to me. I am easily fascinated by various aspects of all the different groups out there. It is so interesting and fun to reach all about them. I would argue that New Vocations does the absolute best job of taking professional pictures out of any group. I follow them on facebook and their pictures always make me click on the ad to read more about the horse. http://www.horseadoption.com/ They know how to make a horse look their absolute best and they frame the picture perfectly. If you are looking how to make your horses stand out than they are the group you need to model! One thing that has the ability to bring me to my knees is going to auctions and looking into the eyes of the horses that know their fate. Heck, I can’t even walk through my local SPCA without crying. I have so much respect for Midatlantic Horse Rescue- http://www.midatlantichorserescue.org/aboutus.htm who is willing to take on the role of buying the thoroughbreds from local auctions. They are local to me and I have bought horses from them in the past and will continue to do so. Bev is a straight shooter who does a good job assessing the horses. Doesn’t that just say it all! I have never met anybody in their organization but just from reading their blog I know that I would feel very comfortable buying a horse from them. After the Races is another group local to me- http://aftertheraces.org/. I had been following them on facebook and they were at a local tack auction that we all went to. I stopped by their booth just to say hi and tell them that I like what they do. Not to mention I snapped up a rambo blanket they had for sale 🙂 They were all very nice and I have heard good things about them. Each group operates so differently. Some only save horses from auctions, some work directly with tracks and others get horses privately donated. The pricing structure varies from group to group ranging from $1 to $10,000 for retrained horses that have been donated. Some groups do extensive retraining, some just a few rides and others don’t retrain at all. Many require extensive contracts which don’t allow for resale, some allow resale after a certain time frame and others support resellers. Many groups don’t allow you to ride the horses but some encourage several rides. We can all debate the merits of which model works best but at the end of the day we all are working towards the same goal. Each of us involved in one of these organizations is doing whatever we can to rehome thoroughbreds in homes where they will be appreciated. Corey found an awesome home! You know that you are doing a good job when your friends send their friends to shop. Alison (Owner of CMA Top Punch and CMA No Time for Love) had told her friend Kim about CANTER and Kim was impressed by Alison’s horses. She will be using Corey as the all around fun horse where she will foxhunt, event, compete in local hunters, trail ride and more. She was impressed by his great brain and willing attitude. I got a text that he has settled in really well and she rode him yesterday and he was perfect. Yay! All of my project horses have sold and went off to their new homes as well. I am down to five horses in the barn today but only one rideable….yep you guessed Letterman is lame again. He had gotten such nice growth on the hind feet that I turned him out with Junior and Bear. All was well and then he came up a bit sore. The ground was super hard so I figured the feet were bothering him because I could find nothing else. He went back to solo turnout where the ground wasn’t chewed up. It is very frustrating because although I really love riding all the other horses there is something to be said about riding your OWN horse 🙂 I really enjoy riding Letterman so I am bummed out. I am shopping for another resale project for myself just to have something of my own to ride again. I will also be bringing CMA Halfway House (that is his name and I LOVE it!) over to the farm this week to get restarted. He is a cool dude that I briefly met when I shipped him down from our MD farm. I mistakenly thought that Ridge would sell and I would restart Corey and Halfway House but Ridge didn’t sell so it was one at a time. It will be warm the next few days so I will get him all cleaned up and ready to go. Very excited to see what he is all about. As a buyer I would want to see the horse out of the ring especially if that was a big concern. As a seller, I believe in taking buyers out on trail rides to show that the horses are exactly as I say they are if not even a bit better. I think sometimes you have to see a horse in action to really appreciate them. Corey is one of those horses who is wise beyond his years and has a great brain. I had a buyer come out who rode him in the ring yesterday and asked to come back to trail ride him today. We tacked up here and threw them on the trailer to head to the local trail place. Kurt was on Junior, buyers daughter brought her pony, buyer was on Corey and I was riding a boarders horse named Bear. Bear is a 20yr old mixed breed more than likely a morgan/qh. We headed out and Junior was in the lead and fired up about it. We had a nice walk just to show that Corey could walk nicely. We jumped a little log which was the first time Bear gave me the feeling he wanted to be silly as he jumped and landed bucking and wanting to take off. No! We had a little trot and then came down to this part of the trail where you have to make a sharp turn walk down a ditch, across the water and up to the road. Corey had a little look since he had not been there before but then navigated it very quietly. We all crossed over the road and had a nice trot. Kurt was way out in front on Junior and I thought he may be having a bit of a tough time but I couldn’t really tell. Corey followed nicely. I kept company in the back with the really nice pony who was being a good girl. Bear was strong and pulling to go faster but we all trotted for a nice long time settling them all in. I asked if she wanted to canter Corey and she did so we let them go first and we hung back a bit. Well old man Bear started bucking and twisted sideways pushing the pony right off the trail. Bad Bear!!!!! Corey and Junior just went about their business while we regrouped 🙂 Then when we did some log jumps Junior got wound up and started his bucking. I think at that point the buyer thought Kurt and I were crazy b/c our horses were being horrible! She marked how nice Corey was about leading or following and not reacting to the other horses. He was happy to go any pace. We had jumped logs, went through water, ditches and water filled ditches. Corey never put a foot wrong and this was only his 3rd trail ride. He is such a good boy! Not sure if she will buy him or not but I would absolutely snap him up for an eventing, foxhunting, trail or lower level fun horse. He is just a happy-go-lucky type of horse. Loaded back up on the trailer and headed back home. I really miss being able to take Letterman out. He was sore behind today and I think those feet are bothering him. Very frustrating but I just have to wait for him to build up some sole. Two of the horses that I had bought for resale have already found awesome new homes. 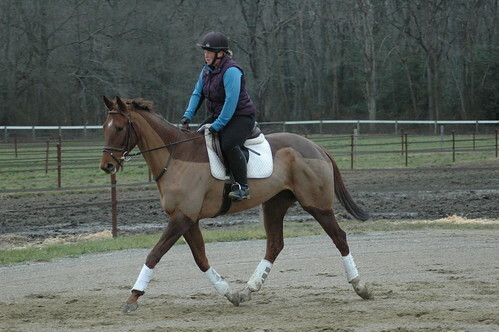 Hope for Spring and Strike up the Jazz will both be heading into eventing as their new career. They both got amazing homes with really good riders who will appreciate their talent. I am so excited to watch their progress. It has been hard to stay as consistent as I would like due to weather. We are under water at our farm and it keeps raining. I am lucky to have my stone dust sacrifice paddocks so the horses can at least move around some but I really can’t turn out in my fields because our clay soil makes for slick conditions and it is not worth them getting hurt. I was able to get Letterman out to a lesson over the weekend and it was very educational. He had been doing really well before his time off but coming back I ran into some of the same issues that we had fixed before he got hurt. The main issue was that he wouldn’t move off the left leg at all which made him stiff, heavy and inverted. Kelly got on him and showed me some really educational ways to address the problem and we also talked about how Letterman is very smart and creative so he gets me off the topic. He jigs, throws his head up, threatens bad behavior and spooks at anything just to distract you from the topic at hand. She showed me that I need to be tougher and do a better job at staying on the topic. No matter what he does he has to move off that left leg. The leg works in a tapping type of fashion so that the leg isn’t stuck in one place encouraging him to lean against it. I was to exaggerate the left bend so that it almost encouraged him to pop out the right shoulder and off the left leg. The left rein was used in a sponging type of fashion and I was to keep my biceps on my side to encourage my arm to be soft. Look over my left shoulder so the hip comes back and the pelvis encourages him to bend left. The right rein was almost an opening rein to invite him to go out to the right with the shoulder so that we could push him off the left leg to the right. He gets pretty darn mad about such a simple request but she stayed persistent yet soft with him. When he correctly moved off the leg she immediately quieted the aids as his reward. Every time he offered the right answer she rewarded. If he got very stuck/stiff she would use a small circle to help her with the positioning of his body and then try to return to a larger circle or a straight line when he stayed correct. I was able to get on and feel it and then the next day I was able to replicate it. It always amazes me how one piece of the puzzle can make the horse feel completely different. He went from stiff, pulling and locked to soft, reaching and flexible in one ride. He is also so smart that I didn’t have to repeat much of it to him the next day. I am really disappointed with all the rain so that I haven’t been able to practice. I have also had too much going on to be able to get to the indoor. Hopefully I can get Letterman and Corey out to the indoor. I found myself muttering to myself that Letterman is in need of a good gallop to blow out the pipes and settle him down. He is not exactly a fun ride when he is on small paddock turnout with no buddies. You would think he would have lost some fitness in the 6-8 wks off. Oh no that is not the case at all! He feels so good right now and getting him to focus on any kind of real work is just not happening. I am trying not to become frustrated with him but OMG seriously he is worst than all the babies. I have taken my own advice about making sure he is not hyped up on anything. He gets just timothy hay and a ration balancer. He looks like a million dollars. I just can’t turn him out on uneven footing or with other horses due to that plate on his foot. My rides have been going a bit like this- OMG jumps sitting in the corner. Will die. Will not go near them. OMG run..spook..run faster. The wind is blowing..the trees moved..omg the trees are moving. Panic. Run. Spook. Was that a noise? Omg what is that noise? Is somebody after me? Look around frantically. Spook. Run. The other horse left the ring. I am all alone. OMG I’m alone. I’m scared. Panic. Spook. Invent more things to panic about. None of this really bothers me but there is not a lot of relaxation in our rides at the moment. Kurt and Jess were laughing because he was just being so stupid. Kurt moved the gate and Letterman about shot me right off his back with a scoot and spook. Really, the gate moved and you thought that was spook worthy? You can ride and ride and ride and he doesn’t seem to relax. Lunging doesn’t seem to help with him. 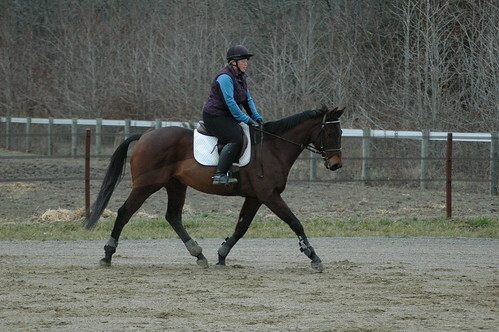 You absolutely have to lunge him with equipment on (side reins or something) because if not he is way too silly. I do think I should so some more lunging to at least see if I can try to get him focused a bit more but he just wants to go and go and go. When he is tough like this he just spooks and grabs the bit in his mouth and you don’t have a lot of power to influence him the right direction. I am sure if he wanted to be really bad he could be but he never has ever wanted to take it to the next level. He just creatively gives you the finger in a way that makes your ride unproductive. I will say all the dressage work has made him more rideable when he is being silly because I can at least move him laterally but I do feel like I am having to be very strong with him. He is a tank of a horse and when he locks up he feels like 1200lbs of solid muscle. I get a work out just trying to resist his attempts to blow me off. It was a fantastic start to 2013 because I was able to get on Letterman. He is getting some growth on the frog and the sole of the foot but he is still wearing the metal hospital plate for protection. I take it off every three days and treat the foot and generally just try to keep it clean and dry. He was so happy to be out and about. Right now he is confined to my smaller stonedust paddock all by himself. Mainly to keep him out of trouble and also a dry spot for his feet. I lunged him a bit to start and he had his tail up and was showing off his fancy trot. He cantered around like a pogo stick just bouncing away. Too funny. He was as spooky as he could be to ride which is normal when he hasn’t been out to the ring in a while. He was giving everything the hairy eyeball. I am probably convincing him not to go shooting off in either direction here. He was like a bouncing ball. I have really been having fun playing with Hope for Spring who I am just calling Big Red. Pitiful but I am not very good with names and he is the only red horse in the barn. This guy just has a top notch brain and feels way more broke than the five rides we have on him. I have taken him out on the trails and he is awesome. He is just one fun horse. We gave him a clip job and it makes him look much thinner. Right now I have them on a light work schedule while I am fattening them up. I am working on getting him off that right leg but that comes in time. I threw that black barrel in there just to see how he would react because it gives you good insight into their braveness for an eventing career. He just came around and jumped it bigger. Very smart horse and so talented. He belongs in an eventing career. Faz is getting some time off to recover from the abscesses. It is good to have two that needed a bit of time so I can focus on a few. The goal is to sell them on when the right homes come along. I am thrilled with them and having a lot of fun. Knock on wood the weather has been cooperative. Rainy but not that cold.